After a debut year on a new course which was overshadowed by traffic and parking problems, organisers of the Chichester Priory 10k can safely say the popular event is back to its best. A shade over 1,5000 finishers got round the course, which began and ended at the Goodwood motor circuit, on Sunday and plenty had positivie things to say about the route and the event as a whole. It was the 27th running of the Priory 10k and the high standard and depth in quality of this race over previous years resulted in another very good turnout of runners. The event’s reputation as one of the most popular and prestigious 10k races in the south and an integral part of the English road-running calendar will not have been done any harm by two finishers beating the magic 30-minute mark. Organisers had worked hard on a number of changes from 2017 including reducing the number of entries and ironing out the glitches that caused traffic problems. Athletes, whether elite, club runners or recreational runners, were delighted with the event and many achieved personal bests, despite windy conditions around part of the motor circuit. Some said how much they had enjoyed the course, the scenery and the iconic Goodwood finish – heartening to organisers. The sun was shining and although it was cold and at times breezy, it was an ideal day for running. The starting party included the president of Chichester Priory Rotary Club, Lucio Lodi, Christopher Doman, founder president of the Rotary Club, Chichester District Council chairman Elizabeth Hamilton, a great supporter of leisure activities, and Melanie de Lacey, an advocate for the Sarcoma cancer charity. Until recently Mel was a fit, healthy mum with a thriving physiotherapy practice – then a rare form of sarcoma was diagnosed. The community has been devastated by the news of her very serious illness. In recognition of her sporting achievements and the work for her cancer charity, a team of more than 140 runners comprising family and friends entered the race, all wearing specially-designed T-shirts which had been donated by Mark Ponsford from Krowmark. The runners made an impressive sight as they streamed away from the start along Claypit Lane, running on public roads for the first 6k. They passed the entrance to Rolls Royce and ran along Madgwick Lane to Stane Street, through Strettington and back along New Road – finishing with a complete lap of the motor circuit. There was a very fast start as the top two men set off at a cracking pace, keeping up with three-minute kilometres all the way. Andy Maud of Highgate Harriers had made it clear he wanted to win in under 30 minutes. He was leading a group which included Richard Allen, Phil Sewell and Joe Morwood (all Aldershot), Ross Skelton and Maxwell Dumbrell (both Brighton Phoenix) and Harry Leleu (Chichester Runners). The leading group, by about 4k, was down to four – Allen chasing Maud and then Skelton chasing Morwood. So it continued to the motor circuit where it had become a two-horse race. Excitement grew – could Maud hold on to win or could Allen, who had run well in the southern cross-country championships the week before, show he had the legs to win? After a very exciting sprint finish Allen won in a time of 29.45, just two seconds ahead of Maud. Spectators been thrilled with competitive edge to the race but were ecstatic to see two men under 30 minutes, with Allen’s time the new course record. 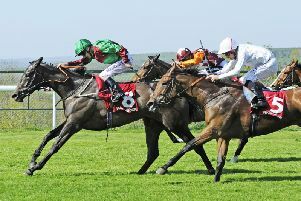 Third was Morwood, followed home buy Skelton, Dumbrell and Leleu, with the young Chichester Runner in sixth place achieving his highest-ever position. The race was one of three qualifying opportunities for the Age Groups Masters England 10k Champioships and the leading athletes from it will don an England Masters vest at the Great Birmingham 10k in May. That meant the standard of the prizewinners in the veteran categories was very high. The men’s vet 40 title went to Mark Worringham (Reading Roadrunners) in 32.59. James Skinner of Haywards Heath was 12 seconds behind with Simon Coombes of Herne Hill Harriers third. Mike Dooley of Team Bath was first over-50 man, Philip Whelpton of Brighton Phoenix leading over-60 home and Peter Young of Ryde Harriers the first vet 70 plus in an incredible 41.41. The Chichester Observer again sponsored the Ben Steppel memorial prize, in memory of our popular lare sports editor, for the first local under-23 man – that was Leleu, winning it for the fifth time in 32.03 – 45 seconds quicker than last year. In the men’s team event, winners, for the first time, were Aldershot, Farnham and District followed by Brighton Phoenix with Chichester Runners third thanks to Leleu, Chris Bird and James Baker, who had come in 19th and 24th. The women’s race was of an equally-high standard with a number of the pre-race international favourites acquitting themselves well. Katrina Wootton from Coventry Godiva, Kate Maltby (Bristol and West) Rebecca Murray (Bedford), Sarah Astin (City of Norwich), Maria Heslop (Tonbridge) and Rebecca Moore (Chichester Runners) were the early frontrunners. By 4k Wootton had a reasonable lead and she went on to win by 36 seconds in 33.23 minutes – a new women’s course record. Maltby was second and Murray third. Sarah Astin in fourth place also beat the 2017 course record. The women’s over-40 winner was Lesley Locks from Hart Road Runners in 38.05. As in 2017, Kathy Bailey of Winchester AC was second, while Charlie Metcalfe of Ryde Harriers was third. The first over-50 woman home was Maria Heslop in a fantastic time of 36.38.Nicky Yeates of Arena 80 was first V60 and Pauline Rich of the Run Academy Worthing was first vet 70. . In the women’s team event Arena 80 AC again took the team trophy thanks to Maisie Trafford, Tara Shanahan, and Dani Tarleton. Tonbridge AC came second and Hailsham Harriers third, with Chichester Runners fourth. The Colin Thorne memorial prize for the first local under-23 woman finisher went, for the second year running, to Alice Cox-Rusbridge who finished in 43:30. Organisers presented the Henry Adams memorial prize to the person with the most memorable story or reason for running. The winner was Mel de Lacy and the award will go towards her charity’s funds, which are approaching £30,000. All the awards were made at the traditional prizegiving at the motor circuit. The presentation party included the starting party plus other guests and sponsors. Thanks went to the staff at the motor circuit and sponsors Wannops LLP, The Run Company and Henry Adams. Organisers also thanked Luckes Live Well and Wileys for support with prizes. Now in its second year on the new course, the race is considered to have been a big success. The winners of the race praised the course, the organisation and the great support and said they planned to return to defend their titles next year and the organisers have promised to be back in 2019 with a bigger and better event.